I'm really sick of making cookies. I thought it would be nice to make cookies for the aunties and uncles this year, instead of sending them a box of chocolates. Major error. I'm very bad at making homogeneous cookies. I would rather be reading. Aw, they’re cute in their heterogeneity. We just had some of the neighbor girls over to make sugar cookies. Ours involve frosting and gel and sprinkles–too much of all of it. Oh well, to my mind, they’re not for eating anyway. They’re for keeping the kids busy the Sunday before Xmas. It isn’t required that home-made cookies be homogenous; their heterogeneity is part of their charm. 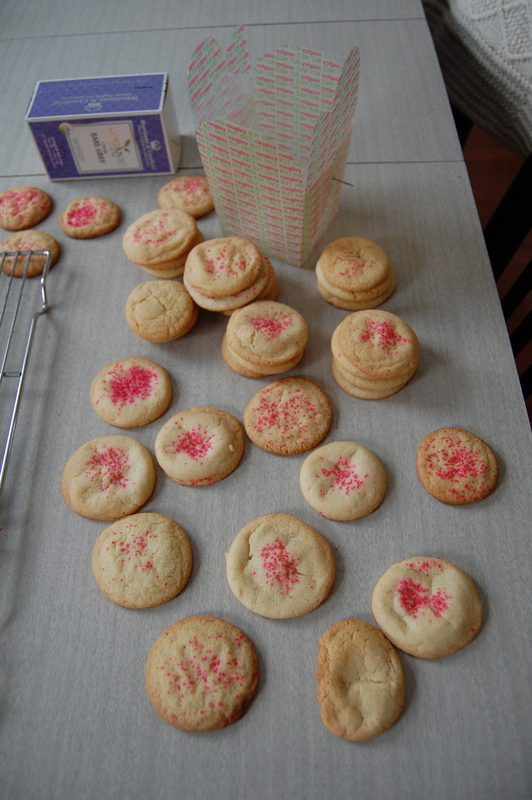 However, these cookies are caving in, which is unsightly, although it doesn’t affect the taste. Without seeing the recipe, it’s hard to be sure why they are falling. Off the top of my head, I would suggest more fat (like maybe an extra egg yolk) and less leavener to produce a cookie with more internal structure and less in the way of unsupportable rise. The best thing is to play around with the ratios, mixing methods, cooking temperatures in a controlled way, thus teaching the children (or yourself) something about chemistry and the scientific method. Another theory: the oven is too hot, causing the sides of the cookie to set before the center, which then sags. Also, if you are making lots of cookies, which is what it sounds like, you have to cool the cookie pans between each time you use them. You can’t put the doughballs down on a hot pan. Y81 in “The Cookie Whisperer”. Thanks. Good tips. I actually didn’t know the pan cooling rule. I’m a good cook, but a novice baker. It’s really a different skill set and takes a different temperment.